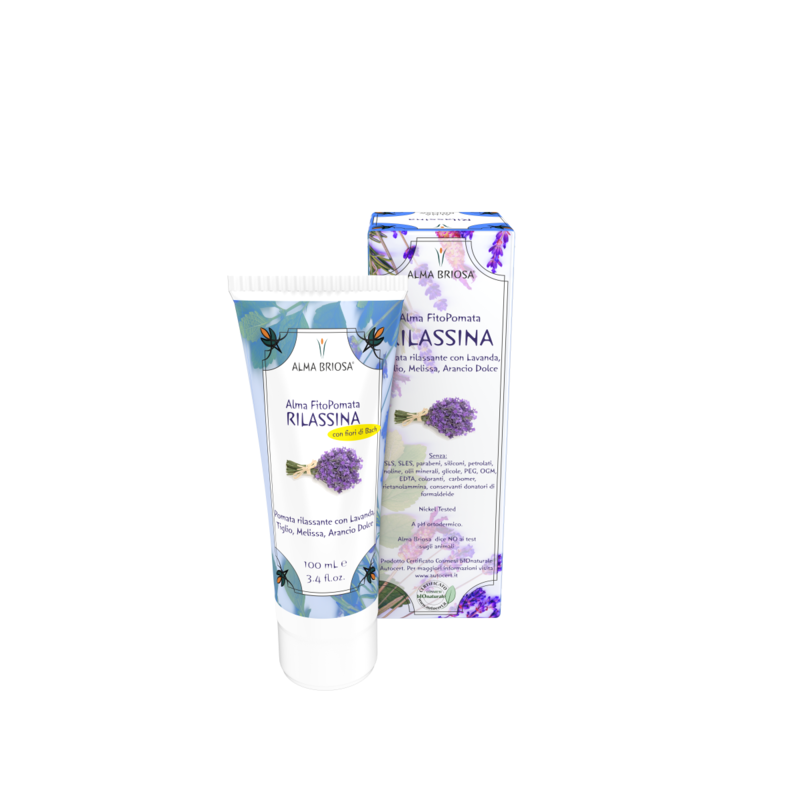 Rilassina is the soothing ointment that helps to counteract the localized muscle tensive conditions, to relieve nervous tension and stress, to favor relaxation and sleep. The contents of Lavender, Linden, Melissa and Sweet Orange extracts are known for their relaxing and soothing properties. Such contents have been used for centuries to prepare infusions and decoctions. Alma Briosa proposes them with a dual action: the extracts direct application onto the skin provides a soothing and relaxing topical effect; the scent of the extracts has an aromatherapic function, easing the mind, helping the nervous system towards a state of relaxation. The ointment contains a floritherapic mixture, prepared with Dr. Bach’s methodology. It serves to alleviate emotional and psychosomatic uneasiness. The action of herbal extracts mixed with Dr. Bach’s remedies resolves both physical and emotional imbalances. Floritherapic mixture used: Clematis, Impatiens, Walnut, Rock Water. Use: apply a thin layer of Rilassina cream on wrists, temples, neck, or on rigid and contracted muscles. Massage slowly to get the best soothing and relaxing action. Can be used several times a day at any age. Bach Flowers	 Clematis, Impatiens, Walnut, Rock Water. INCI	 IINGREDIENTI/INGREDIENTS: Aqua**/***, Vitis vinifera seed oil**, Decyl oleate**, Glycerin**, Cetearyl alcohol**, Sodium cetearyl sulfate**, Prunus amygdalus dulcis oil*/**, Tilia cordata flower extract**, Melissa officinalis flower/leaf/stem extract**, Lavandula angustifolia oil**, Citrus aurantium dulcis oil**, Impatiens glandulifera (Impatiens) Flower Extract**, Clematis Vitalba (Clematis) Flower Extract**, Juglans Regia (Walnut) Flower Extract**, Limonene**, Linalool**, Citral**, Benzyl alcohol, Ethylhexylglycerin**.